Not of Roman origin, Flavius Odovacer (or Odoacer) was an officer in the Roman Army by 470 AD. There is mention of an Odovacrius having fought against the Visigoths in 463, which may be the same person as Odovacer. Chronicler John of Antioch wrote that Odovacer was on the side of the Gothic magister militum, Ricimer, at the start of the battle against the emperor Anthemius, in 472. The scholar, Procopius of Caesarea, described Odovacer as one of the emperor’s bodyguards. Presumably he meant of Olybrius, whom Ricimer promoted to emperor against Anthemius. Olybrius only reigned for about seven months before he died of dropsy in October or November 472, a few months after Ricimer had died from a hemorrhage. The next Western emperor was Glycerius, elevated by the magister militum Gundobad, nephew of Ricimer, the first week of March 473. This was in response to the lack of guidance by the Eastern emperor, Leo I. Leo finally decided whom to name in the West, and chose Julius Nepos, magister militum of Dalmatia, viewing both Olybius and Glycerius as usurper puppets of Ricimer and Gundobad. Julius Nepos could not leave right away in winter to accept his new post and Leo died that same winter. Leo II, grandson of Leo I, inherited the throne and named his own father, Zeno, as co-emperor. In Spring 474, Julius Nepos departed to deal with Glycerius, who had minted coins claiming joint rule with Leo II and Zeno. However, when Glycerius received word Julius Nepos was on the way and the East did not accept his title, he gave it up without a fight and was appointed Bishop of Salona in Dalmatia, where he served until his death. Leo II died 10 months after ascending the throne, leaving just Zeno in the East. In 475, Julius Nepos promoted Orestes as magister militum and leader of the German foederati of Italy. With the strength of the army behind him, Orestes soon rebelled and forced Julius Nepos to flee to Dalmatia, elevating his son, Romulus Augustus, as Western Emperor. Julius Nepos continued to rule in exile as far as the East was concerned. Meanwhile, the troops in the foederati sent word to Orestes they wanted to settle in their new territory and asked to be granted land. Orestes refused and the Scirians and Heruli of the Germanic foederati chose Odovacer as their new leader, as did a great number of the Italian Roman army, naming him King of Italy on August 23, 476. Odovacer marched on Orestes and killed him outside of Placentia. He then marched on Ravenna, capturing it and forcing Romulus Augustus to abdicate. Sources say Odovacer was so taken by the young emperor that he not only allowed him to live, but sent him to Campania to be with relatives and set up a pension of 6,000 solidii. Odovacer took the imperial insignia and sent it to Zeno, a signal that the Roman Empire was once again united under one ruler. Zeno accepted and named Odovacer as patrician to legally govern Italy under the name of Zeno in 476. Zeno also suggested Odovacer accept Julius Nepos back to be the Western emperor, but that request went unfulfilled. Still, Odovacer was careful to mint coins in the name of Julius Nepos until his death in 480. At that time, Zeno assumed sole rule over the entire Roman Empire. Even though Odovacer was ruling under Zeno, he ambitiously expanded his territory. He took control of Sicily from King Gaiseric and the Vandals. When Julius Nepos was murdered in Dalmatia, he pursued the assassins, executed them and assumed control over that territory. In 487, Odovacer defeated the Rugians in Noricum, taking King Felethius into captivity. Prince Fredericus then led the Rugians and Odovacer sent his brother, Onoulphus to deal with them. He ended up having to settle them in Italy, which left the province open and the Lombards later moved in and settled there. Noticing the increasing control of Odovacer, Zeno was seeing a major rival forming, even though Odovacer never made any moves to challenge the power of the emperor or the Roman Church. Zeno appealed to the Ostrogothic King Theodoric to defeat Odovacer, promising him Italy in return. Although Theodoric didn’t trust Zeno, he had his own reasons for accepting the proposal. 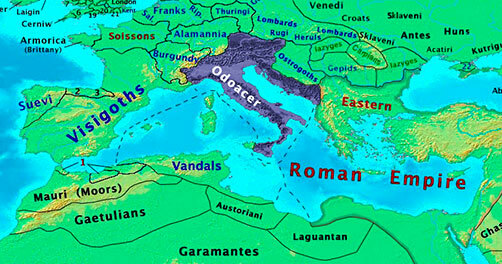 Theodoric led the Ostrogoths to face Odoacer on August 28, 489, at the Isonzo River in Slovenia, Italy. Theodoric was victorious and Odovacer retreated to Verona. Theodoric pursued, won again, and Odovacer retreated to Ravenna. Theodoric continued to pursue, along the way gaining resources from the defectors of the army of Odovacer, including his chief general, Tufa. Tufa was appointed leader of an elite group to defeat Odovacer, but then changed sides again and dealt Theodoric a heavy defeat. Theodoric was forced to retreat to Ticinum. With the turn of events, Odovacer besieged Theodoric. Meanwhile, with the armies fighting each other the Burgundians took over Liguria in the far western part of Italy. In Summer 490, the Visigoths and King Alaric II joined forces with Theodoric and both engaged Odovacer at the Adda River and forced Odovacer to again retreat to Ravenna. Later that year, the Vandals didn’t let an opportunity go to waste and attacked Sicily. Odovacer managed to hold Ravenna until a major clash occurred on the evening of July 9, 491. Theodoric was victorious and Odovacer lost a lot of his elite forces. Still, the city stood strong and Theodoric could not drive out his rival. In August 492, the Goths were assembling a navy to cut off the supply of resources to Ravenna, but that still was not enough. The war dragged on until February 23, 493, when John, Bishop of Ravenna, negotiated a peace treaty where Odovacer and Theodoric would jointly rule the city. Theodoric finally entered the city on March 5. At a dinner party, ten days later, Theodoric drew his sword and struck Odovacer on the collarbone. As Odovacer laid on the ground, his last words were reported as “Where is God?”, to which Theodoric simply said “This is what you did to my friends”. Theodoric the Great would continue as King of the Ostrogoths until his death in 526. Note – Odovacer did issue coins in his own name, but they are quite rare. Although as of the time of writing this article we don’t currently have any on VCoins to offer, if you are interested in obtaining an example of coinage from the King of Italy, you can set up a Want List in your account for Odovacer and you will receive an email when something is added to VCoins which matches your Want Lists. Zeno. Second reign, AD 476-491. Ostrogothic Municipal Coinage of Rome. Prior to AD 536. AE Follis.